As soon as I read about the 2nd Annual Coffeeneuring Challenge I knew I had to give this a try. 7 different coffee shop rides in 6 weeks? Thata's my kinda challenge! I wanted to avoid going to Starbucks, and since my usual days off are Sundays and Tuesdays I needed to find local coffee shops that weren't closed on Sundays. 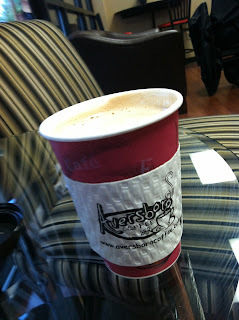 I enjoyed finding a couple of new coffee spots, as well as hitting some of my usual places. Sunday, October 7th I started the Coffeneuring challenge with a visit to my favorite local shop here in Garner, NC- Aversboro Coffee, at 1401 Aversboro Rd. I'd invited others to join me for a 40-50 mile ride, but the weather was looking iffy. I got a café mocha and waited a little while for anyone to show. Soon it was apparent that 1) we were about to have a big thunderstorm and 2) no one was coming. I quickly rode home and waited out the storm. A couple of hours later it was all clear so I went for a solo 45 mile ride on the LeMond, finishing once again at Aversboro Coffee for a small coffee and a brownie, just to make sure it counted! 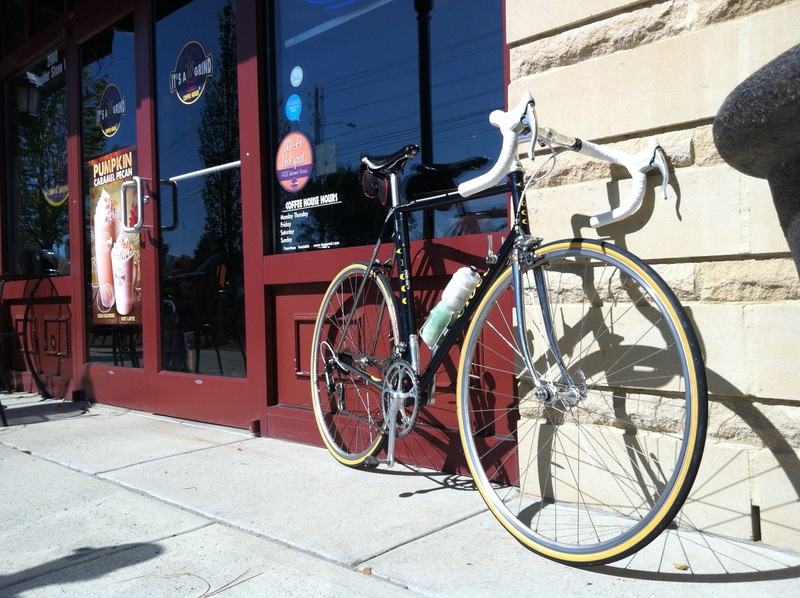 My second coffeneuring outing was Sunday, October 14th. 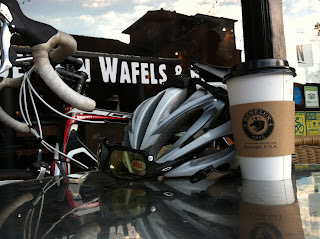 I met Geof for a casual ride in Cary on the condition that somewhere along the way we'd stop for coffee. 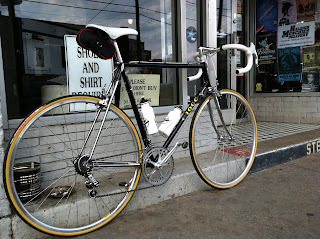 I'd been building an early eighties Italian Ciocc, and I wanted to take it for a spin. 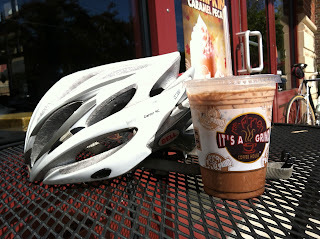 He led me on a 45 mile ride and we stopped at an It's A Grind at 2000 Boulderstone Way in Cary, NC. I got a small iced coffee, and a brownie from some high schoolers outside having a bake sale for charity. I skipped the next Sunday to ride the NCBC Fall Rally so I went for a coffeeneuring ride on my other day off, Tuesday October 23rd. Luckily the rules allow for those of us whose jobs don't have the typical Saturday & Sunday weekend. For this trip I rode solo down to Clayton, NC to check out a shop there called The Coffee Mill at 105 S. Lombard St. 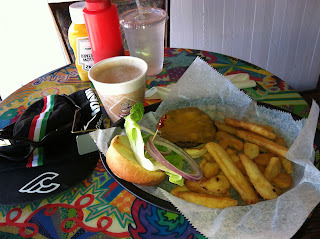 The shop is attached to The Flipside restaurant, so along with my café mocha I ordered some lunch- a very good burger and fries. I'll probably do this run again, since it gets me a nice 25 mile workout and a good lunch too! I'd been riding the Ciocc quite a bit and really enjoying the bike, but it still needed a couple of key parts: I needed to replace the Kalloy seatpost with a Campagnolo one, and the rear wheel skewer was a Shimano- I needed to get a matching pair of period correct Campy skewers. Cycles deOro in Greensboro was having it's annual Tweed Ride and swap meet on Sunday, October 28th so I decided to drive over, look for some vintage parts, and show off the bike a bit. 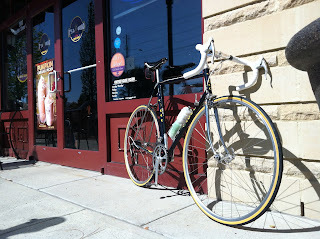 I met up with some friends earlier in the morning before the Tweed Ride for a tour of my old haunts in Greensboro and a visit to Godino's Bakery at 1007 Hwy 150W for a cup of coffee and a muffin. 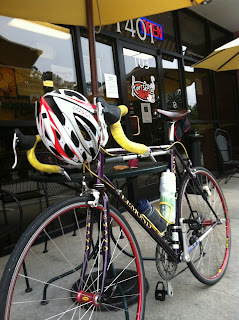 It was a nice 16 mile ride, some roads, some greenways, casual pace and lots of fun. I traded days off with a coworker so he could close on a house, so this week I had Thursday November 1st off. 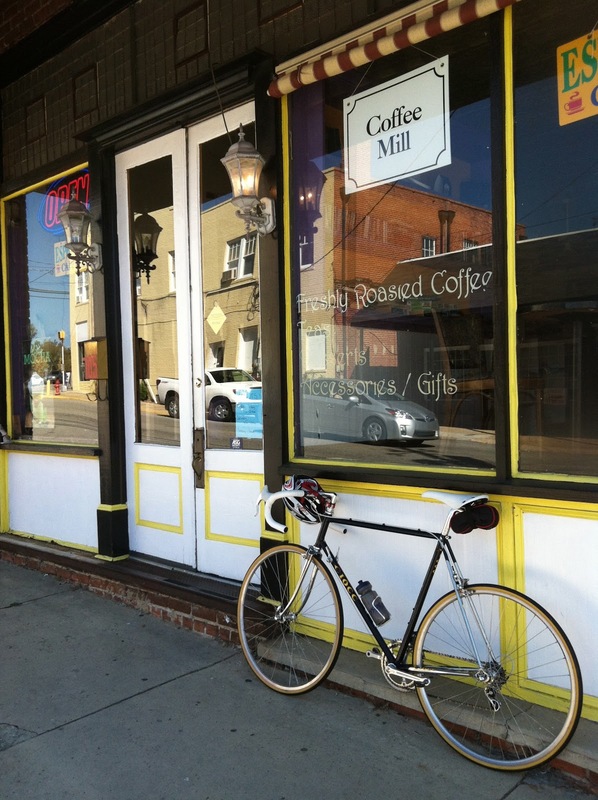 I did a quick solo ride to downtown Raleigh and back for a stop at another favorite coffee shop- Benelux Café at 309 Blake St. in Historic City Market. I had a medium coffee and got in almost 15 miles on the carbon bike. 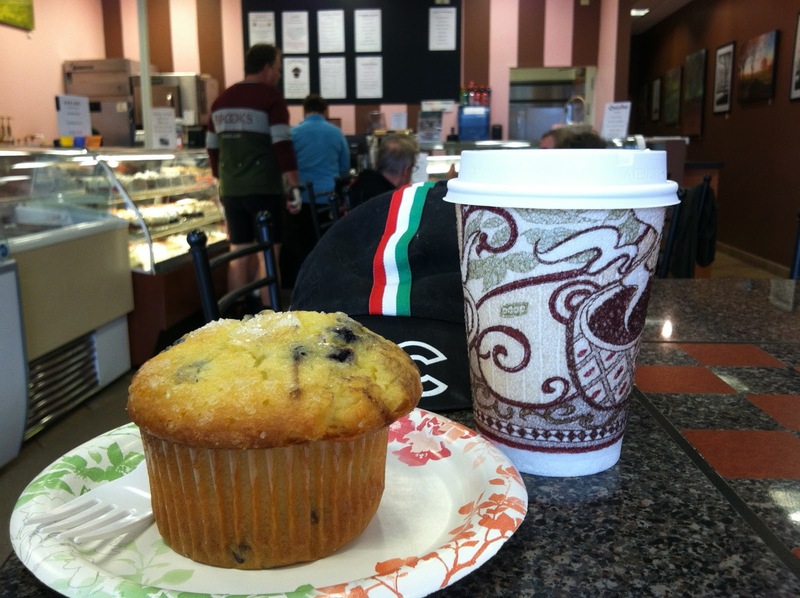 Sunday November 4th was a busy day for me, but I wanted to squeeze in a photo shoot of the Ciocc and a coffeeneuring ride. 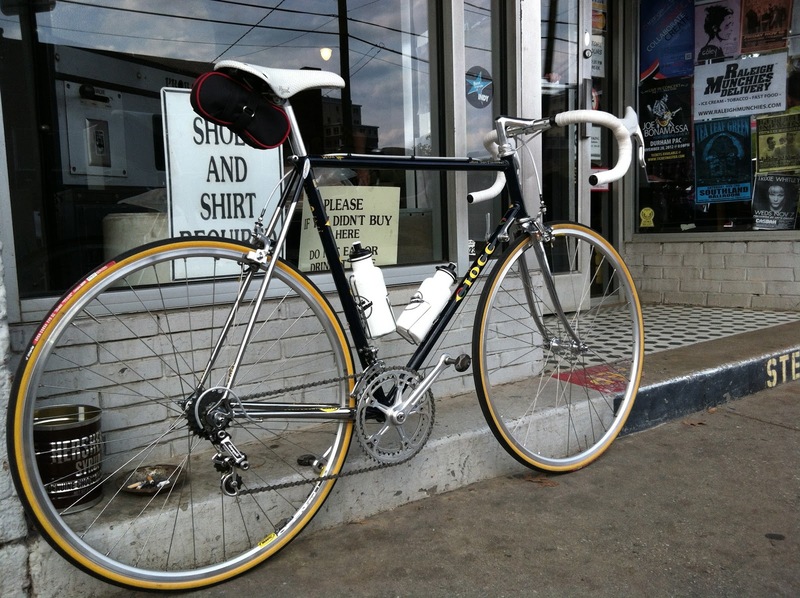 I started at City Market, and took pics of the bike on the cobbled streets, then I rode through downtown to Cup A Joe at 3100 Hillsborough St. near the NCSU campus. I ran into Jon Turner there, he'd just finished pacing the City of Oaks Marathon. I just had a regular cuppa joe, and we talked about bikes and endurance events before I rode back to City Market to head home. It was a short ride- less than 6 miles! For good measure I had an espresso at Benelux before driving home. My final coffeeneuring run was on Tuesday, November 6th- my usual day off. It was cool and overcast, threatening rain. 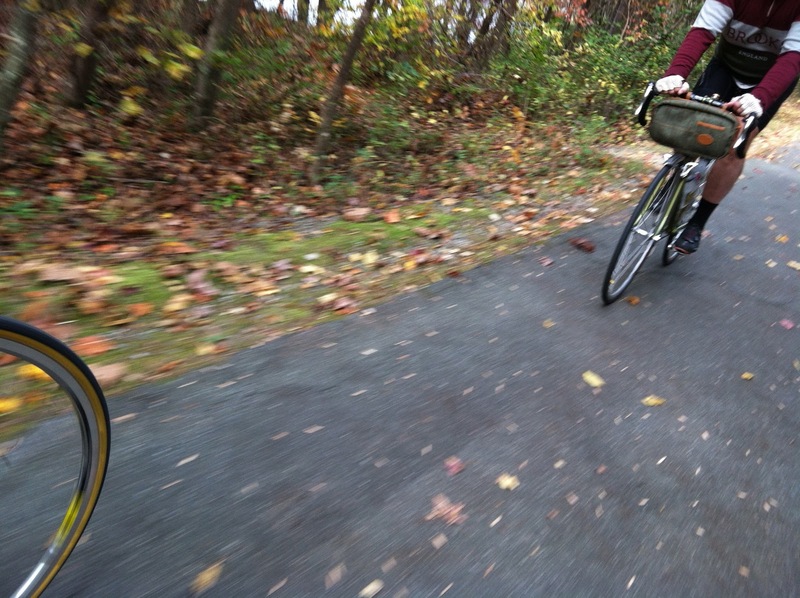 I spent most of the day working on projects at home, then squeezed in a ride late in the afternoon. 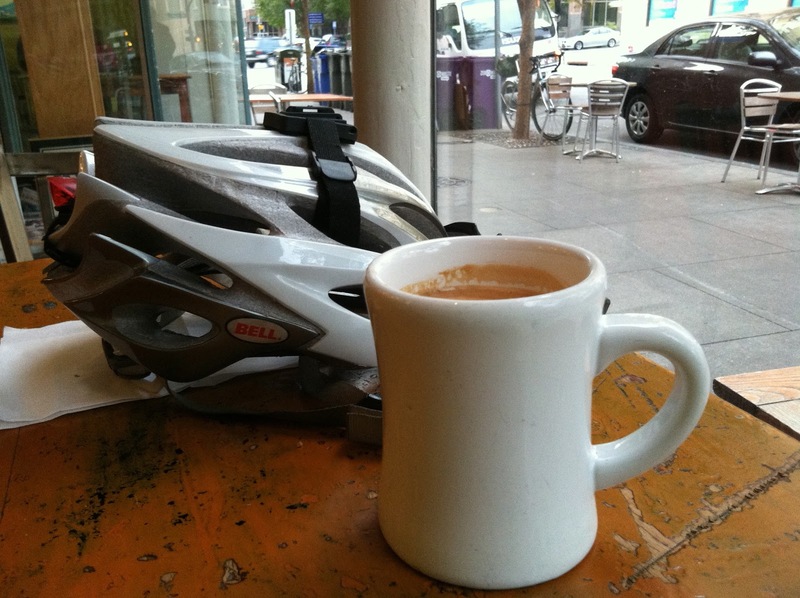 I rode the NYCBikes commuter to downtown Raleigh to visit The Morning Times, 10 E Hargett St. and have an excellent latte. Just a 15 mile ride, with the last half in the dark. 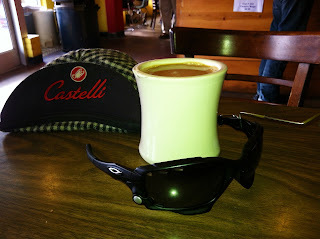 I think I now understand your Nov-10 OEO ride: too much coffee the previous month, combined with not enough on the 10th. Well done! You're right... I've also found that it's not as easy as it initially looks. May I consider this your official submission? Hope you like the premium; they were designed by a Seattle randonneur. Yes, please consider this my submission- I sent a link in an email, did it get through? Thanks, this was really fun! No, link did not go through, but this works. I have you down... first North Carolina coffeeneur in the challenge's two years!